Horrific monsters and spectral presences lurk in manors, crypts, schools, monasteries, and derelict buildings near Arkham, Massachusetts. Some spin dark conspiracies while others wait for hapless victims to devour or drive insane. Itâ€™s up to a handful of brave investigators to explore these cursed places and uncover the truth about the living nightmares within. Designed by Corey Konieczka, Mansions of Madness is a macabre game of horror, insanity, and mystery for two to five players. Each game takes place within a pre-designed story that provides players with a unique map and several combinations of plot threads. These threads affect the monsters that investigators may encounter, the clues they need to find, and which climactic story ending they will ultimately experience. One player takes on the role of the keeper, controlling the monsters and other malicious powers within the story. The other players take on the role of investigators, searching for answers while struggling to survive with their minds intact. 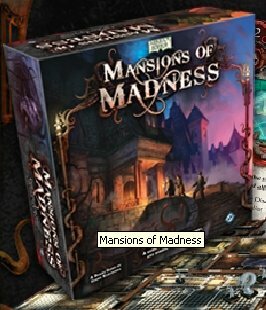 Do you dare enter the Mansions of Madness? So, this game is wonderful for so many reason! If you are into co-operative games, story based games, themed games (specifically horror/love-craft themed) and also games with only a medium high amount of complexity, you've hit the jackpot! You will be hardpressed to find a game with better play elements, better pieces and better depth than Mansions of Madness..